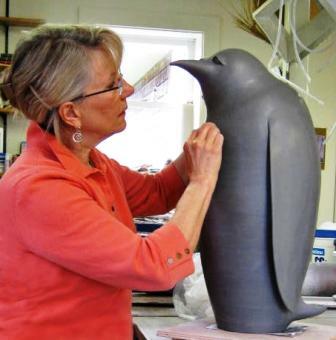 Judy Blake working on a Penguin Sculpture. Judy Blake. Saggar fired Vessel, 2005. 30 cm h x 28 cm w. White earthenware. This piece shows the lines from the ‘fuming’ of the copper wire on the shoulder. Enjoy the elegant forms and birds and the dynamic surfaces of Canadian ceramist Judy Blake. Judy’s specialty is smoke firing in its many forms: naked raku, sawdust and saggar firing. Tucked away in Lincoln, NB, she is making her presence felt on the national and international scene. You can also see more of her work on Judy Blake’s website. This entry was posted in Canada, Ceramics, Contemporary, Earthenware, New Artist Page, New Brunswick, Porcelain, Signature/Mark/Chop, Smoke Firing, Stoneware and tagged Canada, Ceramics, Judy Blake, naked raku, New Brunswick, saggar firing, sawdust firing, smoke firing on March 16, 2015 by Barry Morrison.